Some of those Green Frogs we wrote about last week hang out in a small water garden outside the old farmhouse at Hilton Pond Center. There, they while away the hours, sitting on flat rocks and lily pads, undoubtedly more protected from danger than frogs on Hilton Pond itself. Various pond-based critters that hunger for frog legs--including Common Snapping Turtles and Green Herons and Northern Water Snakes--don't venture into the water garden, perhaps because of human activity nearby. There also aren't any Pickerels (above right)--predatory 30-inch-long torpedo-shaped fish of shallow, well-vegetated rivers and impoundments--but there is PLENTY of profusely flowering Pickerelweed. Pickerelweed is a native aquatic plant that grows almost exclusively in shallow water; in fact, it usually dies out if depths exceed eight inches. As might be expected, Pickerelweed flourishes along edges of ponds and streams--the very places its namesake fish likes to lurk while awaiting the arrival of some unsuspecting frog or fingerling. In fact, a dense growth of Pickerelweed provides just the right hiding habitat for the Pickerel. To our knowledge there are no Pickerel in Hilton Pond, and the only reason we have Pickerelweed on the property is because we planted it in a water garden we installed about 15 years ago. Today, the left half of the water garden--which consists of two connected 4' X 5' pools--is a Pickerelweed paradise (below) that demonstrates the plant's ability to self-propagate--especially when there are no aquatic herbivores to keep it in check. Pickerelweed can be found in ponds, lakes, and streams in almost every state east of the Rockies and even grows in prairie potholes in central areas of the Great Plains. In the north it occurs into Nova Scotia, and grows southward as far as Argentina, so the Carolina Piedmont is well within its natural range. Pickerelweed's most noticeable attribute is a large cordate (heart-shaped) leaf, hence its technical name of Pontederia cordata, which also honors 18th century Italian botanist Guilo Pontedera. The slightly succulent leaves are about 5" wide by twice that long and dull yellow-green (below right). The leaf grows from a fleshy petiole that also gives rise to a single two-foot-tall flower spike bearing numerous one-inch violet-blue blossoms, each with two yellow eyespots (top photo). A close view shows the flower is an unfused tube with a long purplish pistil extending well past petals that curl inward at their tips. Six pollen-producing stamens--three short and three long--are less obvious. Each flower opens in morning and lives only until late that afternoon, but an individual stalk has an on-going series of flowers for a week or two. 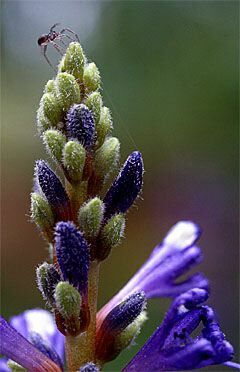 Buds due to open next are almost blue-black, while those that will bloom days later are green and increasingly smaller. Buds of any age are somewhat fuzzy and often harbor populations of miniscule insects and spiders (below left). Although its flowers produce plenty of seeds, a Pickerelweed plant propagates primarily by extending rhizomes (underground stems) in all directions through the muddy substrate of its aquatic home. Under the right conditions, Pickerelweed forms a dense monoculture whose flower stalks, from a distance, can make a freshwater marsh appear to be covered by a layer of blue haze. 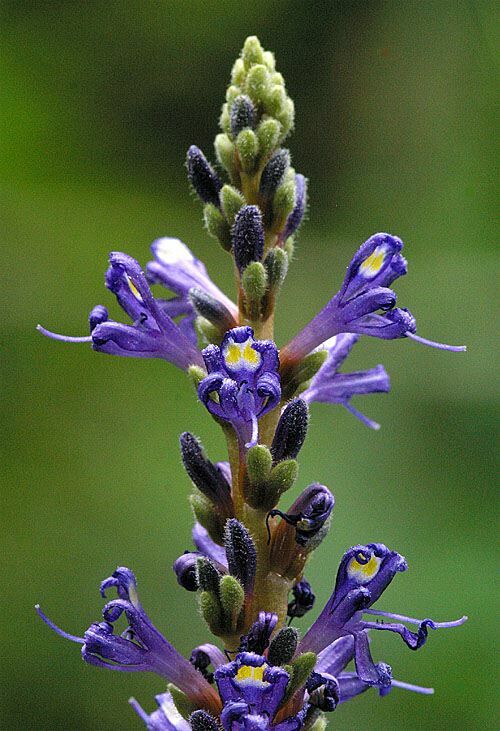 Virtually all Pickerelweed parts are edible, not only by wildlife but by people. The seeds--none of which have yet formed from this year's crop--are starchy and can be eaten raw or roasted and ground into flour. Newly sprouted leaves make excellent salad greens and the rhizomes have been used as a substitute for potatoes in stew. One September a few years back I watched an Eastern Gray Squirrel and later an Eastern Chipmunk selectively dining on old dead stalks of Pickerelweed. The rodents wouldn't touch green stalks or yellow stalks, just brown, dead ones. They seemed to be getting at the heart of the stem and not actually eating the whole thing, so perhaps its tender pith was especially tasty and nutritious. Each fall we usually devote hours to removing old, dead Pickerelweed stalks that accumulate in the water garden during the growing season, so the squirrel and chipmunk were helping out considerably. The Pickerelweed colony at Hilton Pond Center begins blooming the last week in May and continues on until late summer. 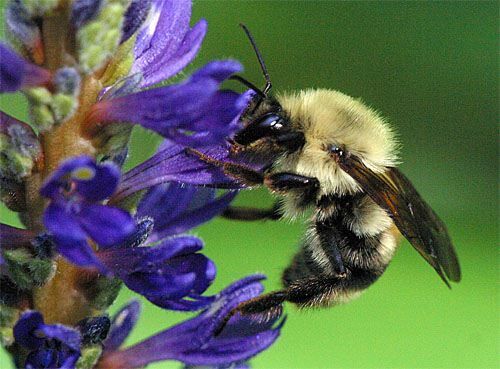 As the seasons unfold, we're always amazed at the numbers of pollinators that visit the inflorescence--a sure sign that each purplish-blue flower bears sweet-tasting nectar. 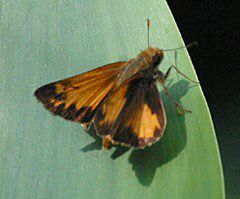 We have seen on our Pickerelweed a variety of butterflies such as the Diana Fritillary (above left) and several Skippers, including Silver-spotted (above right), Zabulon (below left), and--just this week--Lace-winged Roadside Skipper (below right). Bumblebees are also constant visitors to Pickerelweed, but since any given bee only spends a second or less at each flower, we suspect the nectar load of individual blossoms is pretty small. Quick visits also make it frustratingly hard to photograph these frenetic and fuzzy little hymenopterans; below is one of our more successful efforts depicting a male Two-spotted Bumblebee, Bombus bimaculatus. On numerous occasions we have observed Ruby-throated Hummingbirds dining on Pickerelweed nectar--especially in late summer--which brings up a point we'd like to make about Pickerelweed. 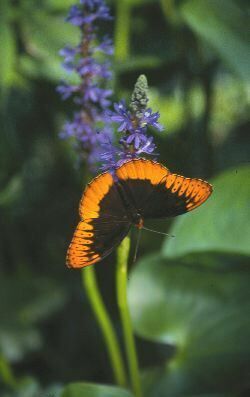 At Hilton Pond Center we frequently get requests for information about what kinds of flowers will attract butterflies and hummingbirds. 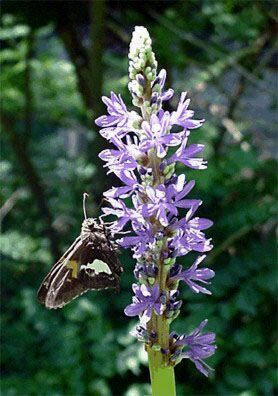 No one seems surprised when we suggest Trumpet Creeper for hummers and milkweed for Monarch butterfly larvae, but folks always look puzzled when we urge them to plant Pickerelweed in a small water garden if they really want to provide for hummingbirds and lepidopterans. 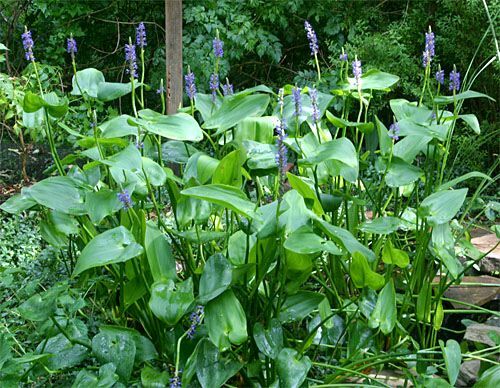 In lieu of a full-fledged aquatic habitat, you can actually grow Pickerelweed in a washtub filled with rich soil, so long as you keep it quite moist. 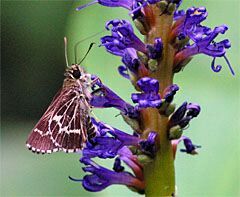 You might not get any Green Frogs or predatory Pickerels, but if the water garden at Hilton Pond Center is any indication, we'll bet big bucks you'll eventually attract butterflies and bumblebees--and maybe even hummingbirds--to your picturesque plot of Pickerelweed. the 6 p.m. newscast on CN2 cable network in Rock Hill SC. **=Banded as nestlings, one of which had a Blowfly larva loosely attached near its eye. --At Hilton Pond Center, the first blossoms of Trumpet Creeper, Campsis radicans (left), opened on 29 May--within a day or two of their average early bloom date. So why is that significant? Female Ruby-throated Hummingbirds, which begin to arrive locally about the second week in April, take a few days to build a nest and then lay eggs that incubate for 14-16 days. Thus, the earliest eggs begin to hatch around the end of May--which happens to be when those Trumpet Creeper flowers begin producing nectar that is a valuable source of energy for new nestlings. A lucky coincidence in timing? We don't think so. In 2004, informative and entertaining hummingbird banding presentations are already scheduled for North Carolina, Ohio, Virginia & Kentucky/Tennessee.